In this video you'll add sound to your commercial to make it more dynamic and exciting. Click on the Sounds tab and choose a sound to play in the background of your commercial. 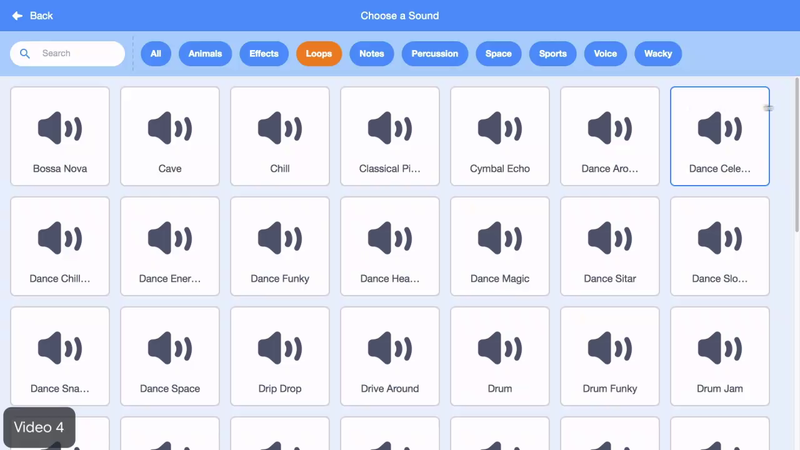 Click the Sounds Vimeo and drag out a play sound until done block. Click on the block to try it out. Add a forever block so that the music will play continuously while the commercial runs. Now the music plays continuously but only when the block stack is clicked. Add a when flag clicked block to make the music and the commercial start at the same time. Awesome, now the music starts when the commercial begins. It's important to use the play sound until done block here instead of the play sound block because the until done ensures that the sound plays to the end before it plays again. Using the play sound block instead makes the sound stutter or play incompletely. This sound seems a little loud for background music. Add a set volume to block after the when flag clicked block and tinker with its value until you like the volume of the music. Explore adding other sounds to your commercial. Add sound to your commercial to make it more appealing and exciting. Add background music using a "play sound until done" block. Play the music continuously using a "forever loop" and a "when flag clicked" block. To adjust the volume of the music, use the "set volume to" block. Explore adding sound to one or more "when I receive" blocks.